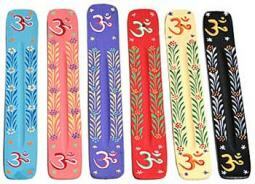 These Wooden Om Incense Burners are new in stock. 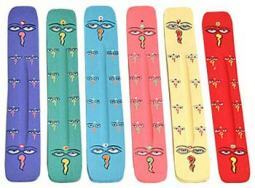 Hand carved in India, these burners measure 10 Inches Long and have a groove down the middle to better help catch falling ash from your incense sticks. These burners will work best with Indian Incense (that has a bamboo stick) and Japanese Incense, such as Morning Star and Ka-Fuh, that DOESN'T have a bamboo stick. 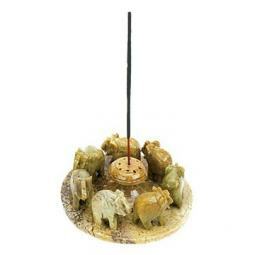 These holders won't work with Tibetan style incense, which is too thick to fit in the small holes of these burners. 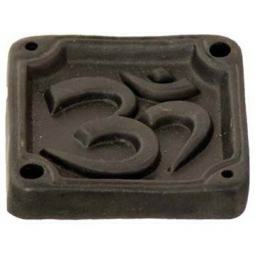 These Om Sign Incense Burners are affordable, so you might want to get several of them at the same time and save on the shipping charges.